I've seen so many of these so-called "food stamp challenge" posts, where well-to-do people try to eat on $30 a week. They always try to buy the things they are used to buying, and find out that isn't feasible. That's not even realistic. I recently had to break down and go back on food stamps. I get the maximum $189 a month, which was $200 before the latest cuts. 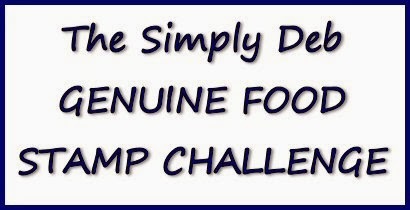 So I'm going to do a REAL food stamp challenge next month, and show you EXACTLY how I spend my food stamp dollars, what I do to supplement, and how it all works out. My purpose in doing this is not to shame anyone, but to hopefully help teach anyone with a small food budget how to stretch it to the max. First, a few facts about why these $30 a week challenges aren't realistic. We don't get $30 a week - we get our entire allotment at the beginning of the month. That allows us to plan for sales and stockpile clearance and BOGO items. We don't eat the crazy stuff people on these challenges eat. Well, maybe we do if we can find it on deep discount, like the meat at Sav-a-Lot that is marked down an additional $1 or $2, but no way are we paying $4.99 a lb. for fresh boneless chicken breasts at Publix when we can get them for $2.99 frozen somewhere else. Even then, we usually don't buy those either. We usually buy the leg quarters in 10-lb. packages for around $.69 cents a pound, or even less on sale. Yes, we splurge occasionally on something like a steak or roast, but if you look closely, you'll see that we ONLY buy these things on sale, and trust me, when we get through with that steak, it's made into 2 or 3 meals. When we do splurge, we do it consciously, because we know we will be eating beans and rice a few days to make up for it. We use coupons...a lot! We know all the coupon tricks, like how to stack store coupons and manufacturer coupons, or use coupons on BOGO's to save even more. We know how to put together a cheap, complete protein. Did you know that brown rice and succotash with butter and flavorings is a complete protein that is also one serving of grains and two servings of vegetables with a little dairy thrown in? Well, now you do, and this is how we eat. We grow our own food, when and where we can. I happen to be fortunate enough to live in a house with a yard where I can plant a garden. Actually, I haven't planted a garden yet, but I will be, and I'll be reporting on that too, and what the dollar value of that produce would be at supermarket prices. I'll also be reporting on growing veggies in containers for those of you who don't have a yard. There's a lot more, but I won't go into it right now. Just subscribe to Simply Deb and read all our posts on how to stretch your food dollars to the max, and what a REAL food stamp challenge looks like. This is very timely because a lot of people -- especially in Wisconsin -- are having their food card money cut by quite a bit. I think a lot of people do not shop sensibly when they are on limited budgets. You are fortunate that you like raw veggies and veggie meals, but many people, including my family, do not like raw veggies. And they expect meat at the supper meal! Good luck with your challenge. It will be interesting to see how you do. I eat for roughly $130 a month. Or $32 a week. My food stamps cover 3/4 of that. I don't complain though. I make cheap recipes I find online or in The Tightwad Gazette by Amy Dascizen. Monday I make Indian Curry for dinner, Tuesday whole grain spaghetti with homemade sauce, Wednesday I can make quiche, Thursday a potato and egg dish, Friday Potato and Spinach soup, Saturday vegetarian chili, and Sunday tuna rice casserole. Breakfast is oatmeal or toast and eggs, lunch is leftovers from dinner. One thing that's good about poverty is it stretches the imagination! Hi Rachel and thanks for visiting my blog. Sounds like you really have your head on straight. I don't get food stamps anymore, but I still eat on less than $200 a month. I set my budget at $200, but I usually come in at about $150-160. I moved, so I'm not close to my beloved Sav-a-lot anymore, so it costs me a bit more for groceries. I still make a monthly trek over there (3 hours on the bus round trip) to get my meats, because that's about the only way I can afford it. What runs my grocery bill up is fresh fruits and veggies. I love them and feel deprived without them, so I consider that an essential. I try to get them as cheaply as possible, only buying what's on sale, but it's still hard sometimes being so far away from Save-a-lot because they have the cheapest and best deals.